The Memorial High School baseball team will count on a deep pitching staff this season. Front row, from left, are Sebastian Martinez, Miguel Reyes, Edison Gonzalez, and Ernesto Polanco. Back row, from left are Tomas Martinez, Jeramiah Deanta, Randy Sanchez, Jacob Acevedo, Gabriel Abreu and head coach Danny Marroquin. Traditionally, the Memorial High School baseball program has been one of the best teams in Hudson County. The Tigers have even reigned supreme in the state, having captured a fair share of NJSIAA Group IV state sectional titles and a few overall Group IV crowns. The Tigers have even been successful on the national level, having gathered the mythical national championship from USA Today in 1988. A lot has transpired in those 30 years since the Tigers were the No. 1 team in the entire country. But one thing remains constant: The Tigers are a team to contend with come baseball season. The calendar might read 2019, but the Tigers will be one of the best teams in the area once again this season. 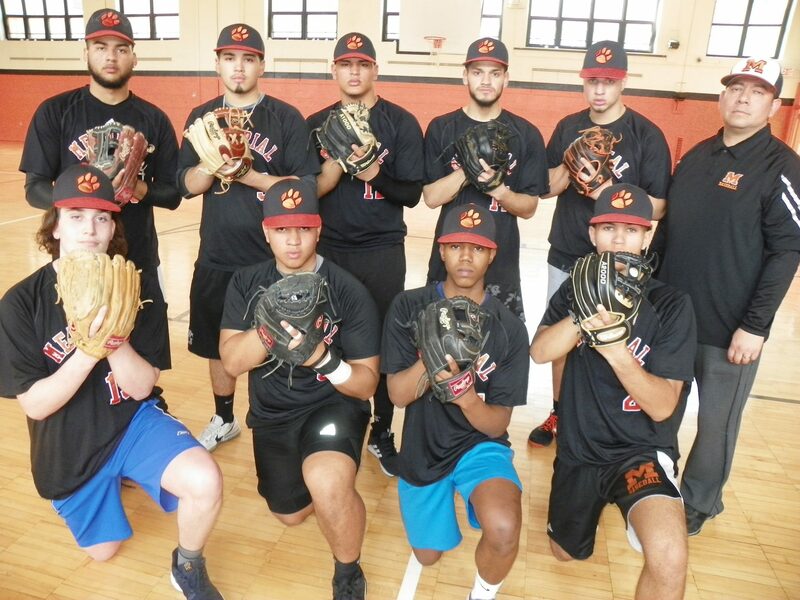 The Tigers were 17-7 last year and with any luck, with a pitch here and there, they could have been strong contenders to win the Hudson County Tournament title that they won in 2017. Instead, the county crown went to St. Peter’s Prep, but the Tigers were right there, like they always are. And since the Hudson County Interscholastic Athletic League decided to restructure the league and put all the larger, more powerful teams in the same division, it means that the Tigers will have to battle foes like Bayonne, Union City, North Bergen and defending county champ St. Peter’s Prep twice instead of just one showdown. That advantage is a lock-tight defensive unit, an aspect that carried the Tigers to the county title two years ago and escaped the Tigers last year, leading to the 17-7 record. Marroquin said that it was tough to watch the Tigers play that way last year. The Tigers should be just fine every time senior right-hander Jeremiah Deanta takes the mound. Deanta earned Hudson Reporter All-Area honors last spring, winning five games. Sophomore righty Ernesto Polanco is also back from last season. Polanco is another fine power pitcher. Fellow sophomore Gabriel Abreu is another member of the Tigers’ pitching staff. Senior Miguel Reyes is yet another key hurler. Junior righty Randy Sanchez is another pitcher who will serve as the Tigers’ closer. Junior Ricardo Tuero is the Tigers’ starting catcher. Junior Tomas Martinez is the Memorial first baseman who has started since he joined the program. Polanco is the team’s leadoff hitter and second baseman. He hit close to .400 last season as a freshman. When Deanta is not the premier pitcher in the county, he’s playing shortstop and serving as the Tigers’ No. 3 hitter in the lineup. “He can handle the bat as well,” Marroquin said. Deanta has already signed on with Mt. San Antonio Junior College in Walnut, California. Abreu and senior Diony Hernandez share the third base duties. Sanchez is in left field with sophomore Edison Gonzalez. Edison’s twin brother Anderson is the centerfielder. Senior Justin Espinal is the right fielder. Espinal hit close to .400 last season with five home runs. He will be the Tigers’ cleanup hitter this spring. “He has a lot of pop in his bat,” Marroquin said of Espinal. The Tigers face a tough early season schedule, facing Hudson Catholic, Northern Valley-Demarest, Ferris, North Bergen and Bayonne in the first two weeks of the season. “We’re going to find outn how good we are early on,” Marroquin said. The Tigers will be very good. They always are.